So you’re a studio that owns a comic book company and you finally have a billion dollar movie focused on one of comics’ longest running superheroes, but you haven’t made a deal yet for a sequel. The creative team wants to really do it right. There is another character in the potential franchise who clearly could hold her own in a solo movie. What do you do? If you’re Warner Bros., you let Amber Heard wait for Aquaman 2. Instead, you go for a lower budget horror film that technically ties in to Aquaman — you decide to venture into The Trench, which is both an Atlantean kingdom and the (once upon a time) people of it. Hold on, it’s really not as crazy as it seems. In fact, it’s a pretty interesting idea to explore a corner of the DC Universe without exploiting a marquee character. 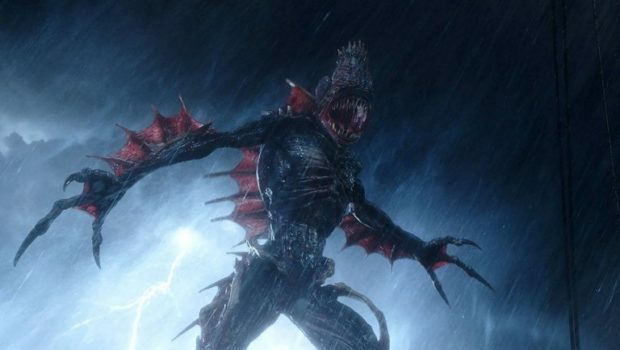 Introduced in the New 52 reboot of Aquaman by Geoff Johns (which is pretty good), the horribly mutated Atlantean kingdom known as the Trench made a relatively brief, but effectively startling, appearance in James Wan’s Aquaman. Though I’m wagering they guard the entrance to Skartaris, another DC Universe fantastic kingdom, that idea can be saved for Aquaman 2: Arthur Has Another Beer. The Trench is going more for, say, Humanoids from the Deep. According to the Hollywood Reporter, Noah Gardner and Aidan Fitzgerald have been hired to write the script, which will be produced by Aquaman director Wan and DC Films producer Peter Safran. Other than that, we just know it’s dark. Really dark. Because there is no light in the Trench. I’m in — but I do think we should get a solo Mera film.